Srinagar, April 04 (KMS): Indian authorities stopped a woman from Azad Jammu and Kashmir who married to a resident of occupied Kashmir while she was returning to Pakistan via Wagah-Attari border to meet her parents. Srinagar, April 04 (KMS): In occupied Kashmir, the Human Rights Commission has asked the Divisional Commissioner, Kashmir, to file his response to a petition seeking details of the detainees booked under draconian law, Public Safety Act (PSA), till date. The petition filed by the Chairman of International Forum for Justice and Human Rights, Muhammad Ahsan Untoo, has also sought directives from the authorities to shift the detainees to the nearest place of their residences. Srinagar, April 04 (KMS): In occupied Kashmir, the Hurriyat forum led by Mirwaiz Umar Farooq terming the upcoming so-called Indian Parliamentary elections in the territory as a futile exercise has urged the people to stay away from the polling process as it can in no way help in resolution of the Kashmir dispute. Srinagar, April 04 (KMS): In occupied Kashmir, thousands of devotees thronged Hazratbal shrine in Srinagar and offered night-long prayers to observe Shab-e-Meraj. Residents from Hazratbal and other areas were seen offering tea and eatables to devotees. Some of the religious and social organizations had also erected makeshift tents to serve Kewha to the devotees. Srinagar, April 04 (KMS): In occupied Kashmir, unknown gunmen killed a panchayat member in south Kashmir’s Kulgam district. Srinagar, April 04 (KMS): In occupied Kashmir, Hizb-ul-Mujahideen has paid glowing tributes to noted freedom leader, Ghulam Hassan Khan alias Saif-ul-Islam, on his 16th martyrdom anniversary. The Hizb-ul-Mujahideen in a statement issued in Srinagar paying homage to Saif-ul-Islam said that he was a great leader and was martyred by Indian troops on April 02, 2003. Saif-ul-Islam gave up the luxurious life and devoted his life for the Kashmir liberation movement and eventually achieved the martyrdom, the statement said. Srinagar, April 03 (KMS): In occupied Kashmir, a member of local panchayat was critically injured after being shot at by unknown gunmen in Kulgam district on Wednesday evening. Srinagar, April 03 (KMS): In occupied Kashmir, Indian troops launched massive cordon and search operations in all major South and North Kashmir districts, today. Srinagar, April 03 (KMS): In occupied Kashmir, Kangan area of central Kashmir’s Ganderbal district remained shut on Wednesday on the first martyrdom anniversary of a local youth. Srinagar, April 03 (KMS): In occupied Kashmir, the Indian authorities in their ongoing onslaught on local media in the territory have banned advertisements to an Urdu daily, Kashmir Uzma. 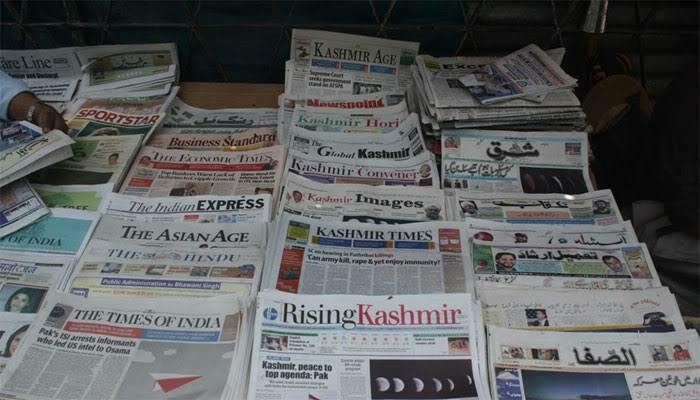 Srinagar-based two widely read newspapers Greater Kashmir and Kashmir Reader are already facing such ban for past many months.